The ninth report in the Customer Experience Management Benchmark (CXMB) Series, the 2016 Corporate Edition extends previous trend lines and expands on areas recently explored in the 2016 Consumer Edition. Once again, the CXMB Series Corporate Edition report was well-supported by the community, with participation from a broad array of companies and industries including DTE Energy, Hyatt, kohl's, Nintendo, HomeAdvisor, Sony, Petco, Marriott, FedEx and more. First published in 2012, the CXMB Series Corporate Edition now presents significant depth, with many findings now trending over the last four years. In 2016, the Customer Experience Management Benchmark (CXMB) Series reports saw a number of new areas of exploration, particularly around the multichannel experience, omnichannel migration, channel consistency and the alternative channel journey. These new topics, along with the tried-and-true exploration of channel results and strategic and operational insights, have helped to shape one of the most robust and comprehensive sets of reports so far in the series. "The intelligence in the CXMB report helps us identify opportunities to improve the customer experience and create competitive advantage for our brands and dealer network." "The Corporate Edition of the CXMB Series provides great insight into current trends and best practices in Customer Care. With feedback from other like-minded professionals, the report helped me understand how companies are investing and prioritizing their customer experience and channel strategy efforts. An added benefit in this year’s report is the comparison of the consumer’s view to the corporate responses, very enlightening. This is the best benchmarking report that I have seen for Customer Care Executives." "I accessed this report for the first time and I was positively surprised by how valuable it was. 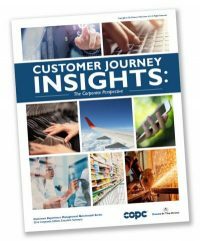 The CXMB series 2014 Corporate Edition provides great insight into how other organizations are supporting the connected consumer, across multiple channels. Reviewing the standard set by other customer executives, various market conditions, and the expectations of consumers, helps our organization validate some of our assumptions and validate we’re on the right track with our own efforts." The CXMB Series is a collaboration between Execs In The Know and COPC Inc.
For over 15 years, Execs In The Know has built a reputation of excellence in the Customer Management Industry and a worldwide community of over 50,000 Customer Experience Professionals. Execs In The Know connects people to engaging industry content, thought leadership, current trends, peer-to-peer collaboration, networking and industry employment opportunities. Examples of this can be seen at their Customer Response Summit events, roadshows, webinars, workshops, Blog Talk Radio segments, Industry Benchmarking Series, blogs, thought papers and social communities. To learn more about Execs In The Know, visit www.ExecsInTheKnow.com. COPC Inc. is an innovative global leader that empowers organizations to manage complex customer journeys. With a focus on driving improvement, the company provides consulting, training and certification for operations that support the customer experience. With improved operational performance, COPC Inc. clients create loyal customers and achieve increased revenue and reduced costs. Founded in 1996, COPC Inc. began by developing the COPC® Family of Standards and helping call centers increase their performance. Today, the company works with hundreds of leading brands worldwide to optimize key customer touch points and deliver a seamless experience across channels. COPC Inc. has conducted assessments in more than 70 countries, and has operations in North America, Europe, Middle East, Africa, Asia Pacific, Latin America, India and Japan. For more information, visit www.copc.com.